Today I have a preview of the latest coming month’s limited edition installments from Aussie Indie brand Femme Fatale. This polish is Amanita – Femme Fatale’s inclusion in the Polish Pickup (PPU) for December 2018 – Polish Swatches below. 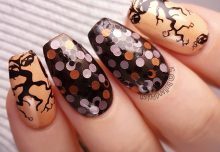 This is a magnetic polish! So do keep that in mind when viewing swatches. Middle finger magnetised lengthwise, the rest were at an angle, usually on a diagonal. And that’s a wrap! 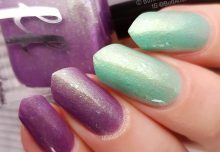 I hope you enjoyed Amanita – Femme Fatale PPU, Dec 2018 – Polish Pickup Swatches photos. Name: Amanita – available online at ThePolishPickup.com. Smoothly applied, this took 3 thin coats for full opacity, and is shown with top coat. Another flawless application from polish-making-masters Femme Fatale. Amanita is actually a magnetic polish too – which you can see the effect of more distinctly in the bottle shots. It is an inky blue jelly with red iridescent flakes, red aurora shifting pigment and green magnetic shift. This has a lot going on and I hope you can see that from my imagery. I did try to capture all appearances in the one shot. You know, cos I like to complicate matters, haha. Amanita PPU – available online at ThePolishPickup.com. It’s available as a pre-order for $15 USD – cap of 250 units. From December 8th at 1am – 11th at 2pm, 2018 AEST (this is the converted AEST timezone). 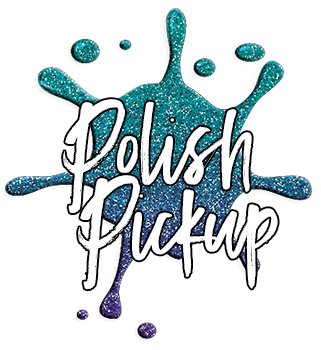 The Polish Pickup (PPU) polishes are a limited edition shade usually available for pre-order for a limited time at beginning the First Friday of each month (US Timezone). THE CONCEPT: Each month PPU brings you a variety of polishes from indie makers based on a theme voted on by you. Voting takes place on the website. Indie makers can come and go as they please, and all are welcome. PRE-ORDER TIMES: The Shop is open for pre-orders/goes live the first Friday at 11 AM EST, of each month and stays open for four days, through to the following Monday at 11:59 PM EST. This is the ONLY time frame in which the monthly polishes will be available for purchase. The remainder of the site remains open all month long for browsing and communication purposes. You can read more in the PPU official FAQ. Find the Polish Pickup on Instagram.